When adventure calls upon you, and should you have a weakness for such things, there is hardly a way of not complying…even if you are a mouse! 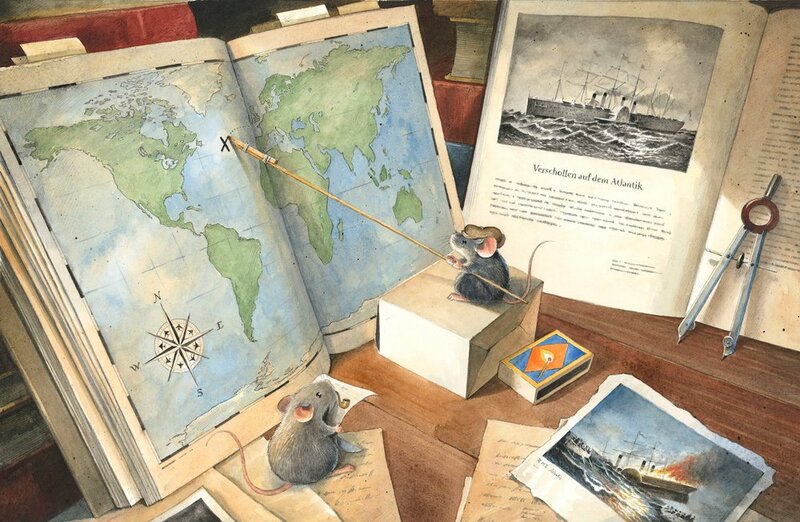 Written in old-fashioned mouse language, Pete, the little mouse brings a sheet of paper to the professor of the University of Mice. He needs a bit of help in his quest to find more information on this ancestor and what has possibly come of this treasure. Kindly the professor helps him search for clues in newspaper clippings…and oh no…the transatlantic liner that Pete’s relative was on sank to the bottom of the sea. But mice are resourceful and it does not take them long at all to locate where this wreck with the treasure might be! Pete tries his hand and building a contraption that would serve as an underwater swimming machine. He experiments with glasses and waits and learns about buoyancy and what it means to be trapped during the experiment! Luckily the professor saves him. 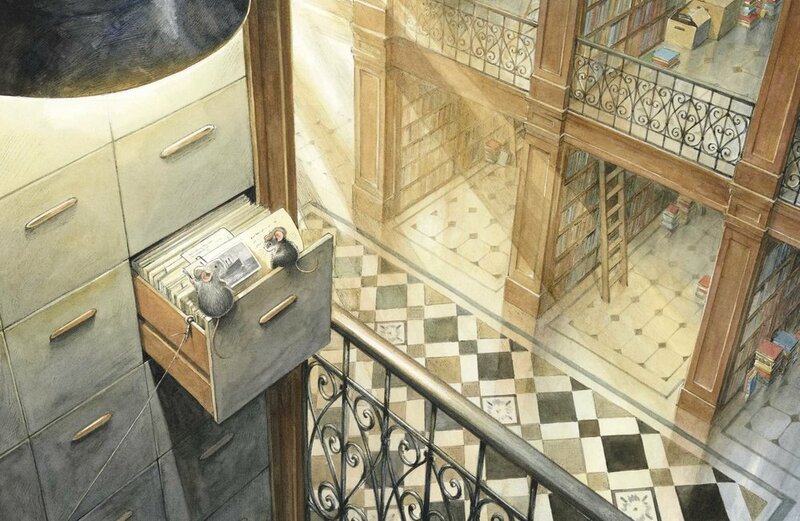 Together they embark on visiting a museum on nature study and hit the books to learn from other inventions. 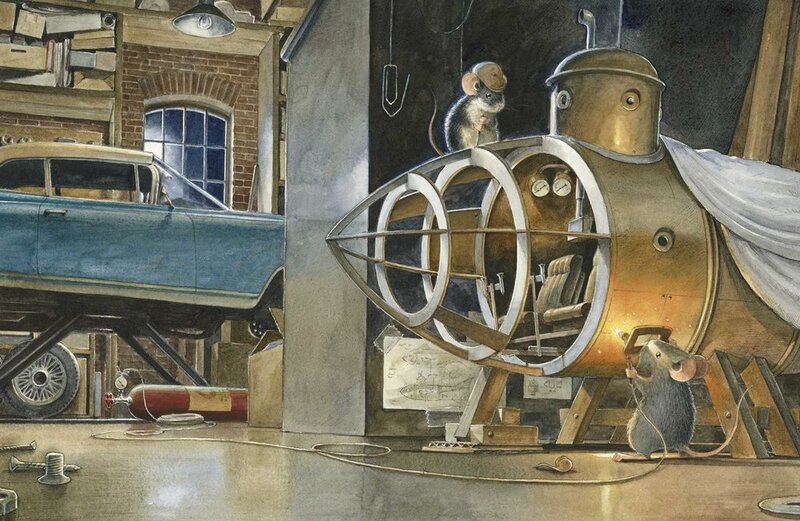 With clever ingenuity, they draw up plans for a mouse submarine and get to work in a garage to build the parts and put the contraption together. And then comes the day they have waited so long for. Disguised in a box of a shipping container, they make the journey across the Atlantic to dive for the sunken ship. How will this adventure turn out? There are dangers lurking all around. 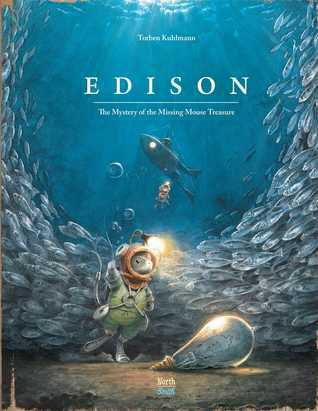 From furry to scaly animals and ocean giants…this sure becomes an unforgettable trip and the discovery of secrets…. Could mice have been the real inventors of human ideas? I found out about Torben Kuhlmann through some posts on Twitter. Since the illustrator is from Germany and some years younger than I, I had never heard of him before while living in GE. However, I was immediately smitten with his art and hoped to be able to read one of his books. I was very lucky to discover it on NetGalley. The illustrations in this book are gorgeous. The colors and hues are soft and the general allure speaks of old fashioned charm. It has historical fiction elements and it came together perfectly. A real treat. As of late I am really enjoying and appreciating these sort of books. Book illustrations have come such a long way, yet they make you feel like a young kid again. The elements to discuss are boundless from this book. If you are reading with a child, there are so many themes one could talk about. The crossing of the Atlantic, ship wrecks, library catalogues, inventions…they are all conversation starters and a lovely way to spend time with littles. There are beautiful pictures of famous inventors scattered though out and there is more information for readers at the end of the book. I received a digital copy of this book from NetGalley in exchange of an honest review. All opinions are my own. Thank you kindly!